Boy, things sure do seem to move in slow motion sometimes, don’t they? That’s how it feels when it comes to finishing my kitchen. We have grand plans, but life gets in the way on occasion – and that’s okay. This house remodel has been a great lesson in patience and perseverance for me. And while my tendency is to ‘hurry up and get it done’, I’m actually glad that we’re taking it slowly. I’ve known for a long time what I wanted in a kitchen. Finally having the basic shell done is making it so much easier to be intentional with my decorating decisions – well, except for figuring out the backsplash – more on that later. So, with all that being said, it’s time for a kitchen update. The last time that I showed you the kitchen the granite counters weren’t installed and the lanterns above the island weren’t hung yet. To add interest and warmth and to break up all of the white, I used gray cabinets (from the same cabinet line) for my island. I wrapped the island in matching baseboard and added dummy cabinet doors to each end of the island to make it look more like a piece of furniture. 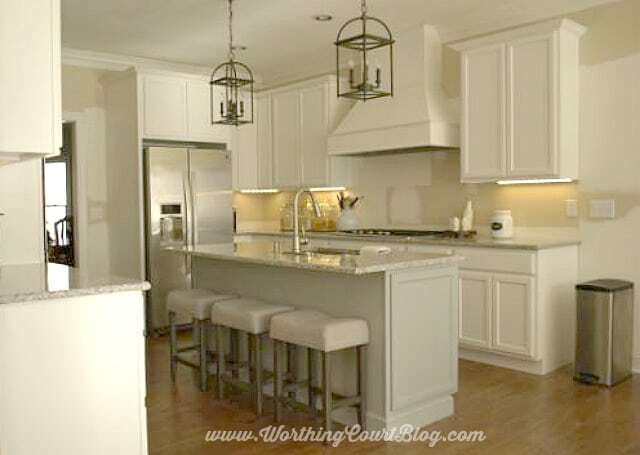 The addition of the baseboard also helps to “ground” the island since it’s floating in the middle of the room. We ripped up the vinyl that the previous owner had and added hardwood floors stained in rich, warm brown that isn’t so dark that it shows every spec of dust. Searching for just the right granite was a huge process. Trying to mesh color and pattern desires along with a budget isn’t easy sometimes, but I am in total love with what we chose. It has all of the warmth and color that I had hoped for, without being too busy for me. My sink is located in the island, which is right in the middle of the kitchen area. The Delta faucet is like jewelry and I love it. I originally wanted polished chrome, but a friend warned me about the difficulty of keeping it free of water spots, so I went with brushed nickel instead. 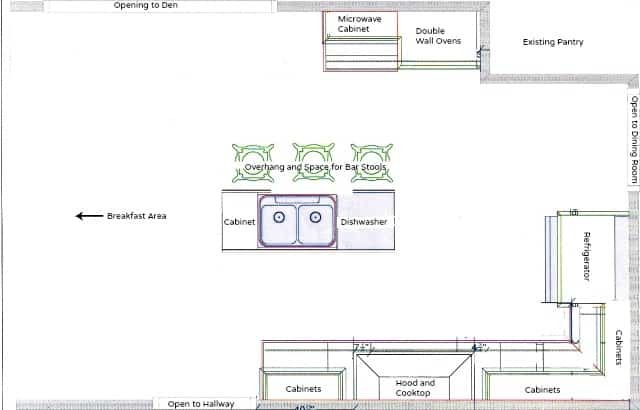 The layout of the kitchen is perfect for me. Everything is just a step or a turn away, right down to the location of my trash can. And believe me, we had lots of discussion about where the trash can should be located! Pookie is such a supportive hubby – we have an agreement. I get 55% of the vote on the house design and he gets 55% of the vote when it comes to our cars. I always seek and value his opinion, and want him to be happy, but, he is an engineer and his natural tendency is to maximize every square inch of space. In his mind, it’s more about function than form. I’m pretty much the opposite. I bet a lot of you ladies can identify with that gender difference! So fighting (not really fighting, more like insisting) to have my cooktop and hood be the only element on the one wall was a biggie for me. But I’m sooo happy that I stuck to my guns. It’s exactly the feature that I wanted it to be. I searched and searched for bar stools that I like and was tickled pink when I ran across these at Target. 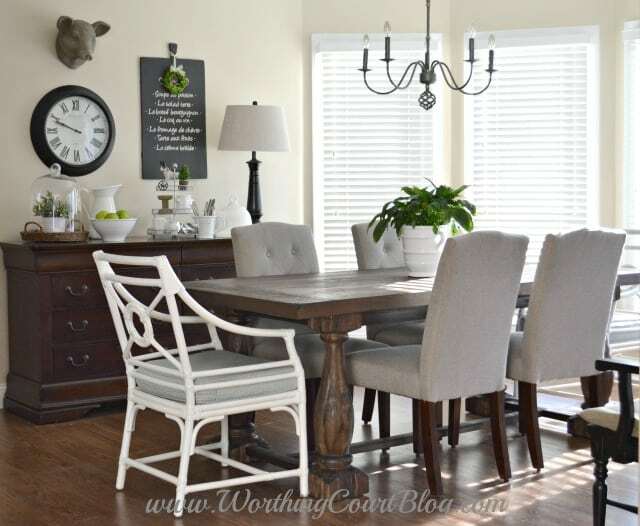 They fit into the style of the kitchen perfectly and look great with the chairs at the breakfast table. 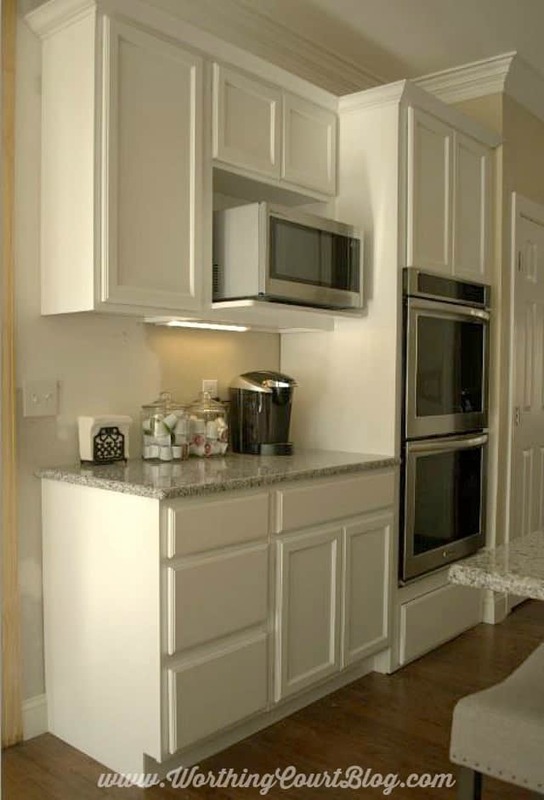 The pantry, microwave and wall ovens are located on the wall on the other side of the island. Having the dishwasher located in the island is so convenient. I can place everything on the island, nearest the cabinets that each item goes into, so that I’m finished unloading and putting everything away in a snap! The kitchen renovation is nearing its end (yay! ), but we still have several things to do. Hardware needs to be added to the cabinets, the light rail needs to be added to the bottom of all the cabinets, the baseboard needs to be completed and the whole kitchen still needs to be painted. But, foremost in my mind right now is trying to decide on a backsplash. I’m weird because I don’t want anything that will be too busy next to the granite. 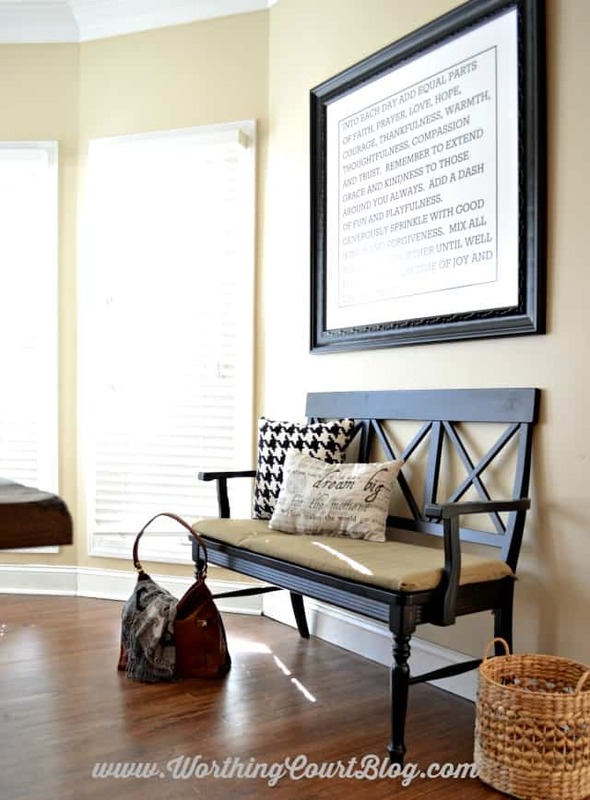 Should I do white beadboard (love! 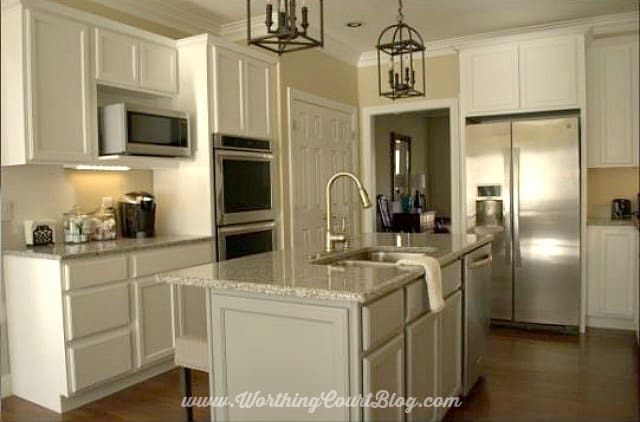 ), white subway tile or gray subway tile or something altogether different? What do you think? In spite of all the stress of decision making, it’s been so much fun to watch my dream and vision come to life! I’ve made changes to the breakfast area at the other end of the kitchen too. Barstools – Threshold Linen Saddle Stool from Target These are on sale online for a great price right now! Wow! Absolutely beautiful and it’s not even finished! I know that you are loving it! Doesn’t it feel grand to stand back and see your vision becoming reality? What color are your cupboards? They look like a creamy white from the pics. The lanterns are perfect! While beadboard is lovely and certainly has that country feel, It might be hard to clean the splatters from your cooktop. Can’t wait for the final reveal. Hi Joanne. My cabinets are pretty much a true white. 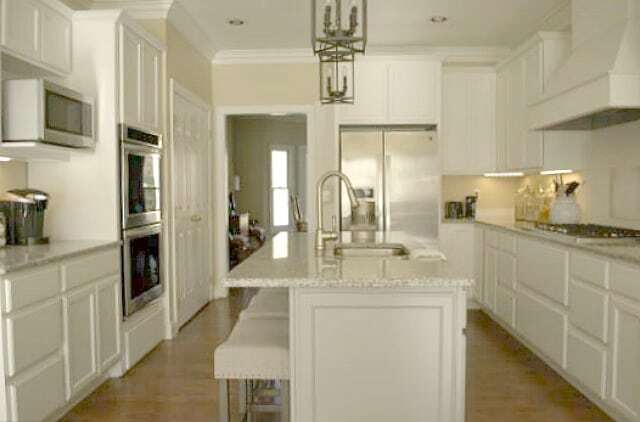 I have the same concern as you about the beadboard – it could be a pain to keep clean behind the cooktop. What a wonderful, comfortable room! You made some great choices, and I am loving the results. Thanks for sharing. Your new kitchen is incredible, Suzy!! Seriously … it belongs in a magazine as it is, so I can only imagine how gorgeous it will be when you’re all done!! You must be over-the-moon thrilled at your accomplishment … can’t wait to see more!! Awww – you’re too sweet Becca. Thank you! It’s just stunning, Suzy, but then I knew it would be! I would love to cook in there with all that room! I’m so glad you’re nearing the finish line….on this project at least! You can come over and cook anytime that you want to, Marty! It’s nice to have a major project so close to being finished. Alright!!! It’s starting to look like a home, instead of a house. It does take forever doesn’t it….ESPECIALLY since you are working on the whole house instead of one room. I know it it overwhelming, but you are making it so beautiful!!! Of the dee choices, I think A gray backsplash would tie the island in well. And I love the bar stools…they look great with the breakfast chairs!! Yeah, I’m leaning toward gray for the backsplash. Possibly something in a matte finish. I brought several tile samples home yesterday, but finding just the right gray is going to more difficult that I thought! I vote for the white subway tile. 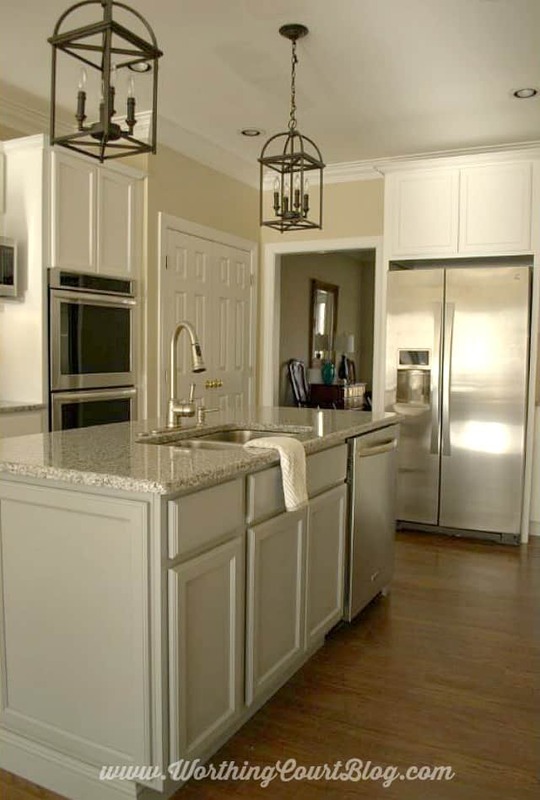 If you ever change kitchen colors, the gray may not work, which equals more money. Now, I sound like my husband. Suzy I love what you have done and chosen for the kitchen. The lanterns over the island are fantastic. Sometimes, I find people underestimate Lowe’s and Home Depot for lighting. They both have some great stuff. Your seating area is perfect. Thank you, Cindy. I agree that the big box stores have come a long way in their lighting. Hope you’re continuing to enjoy your new home! Beautiful!! I am in love with it all! Thanks for sharing at #inspirationmonday – it’s truly inspiring! Thank you, my sweet friend! I’m zeroing in on a backsplash – now I just have to be patient until the tile guy can get to me. It’s looking beautiful! I think the faucet choice was really smart, and it looks great! Thank you so much, Shannon. Happy New Year to you too! Hi Catherine. I found the clock at Target. Thank you for stopping by! I love all the choices you’ve taken, the lights are awesome. It’s a beautiful kitchen! Thank you, Cristina! I drooled over those lanterns forever! Suzy, your kitchen is just fabulous! I’m pinning and sending it to my sister-in-law who is building a new house next to us. I love every detail that you’ve selected, and I vote for gray subway tile, too! I, too, think the beadboard would be difficult to maintain in that area. 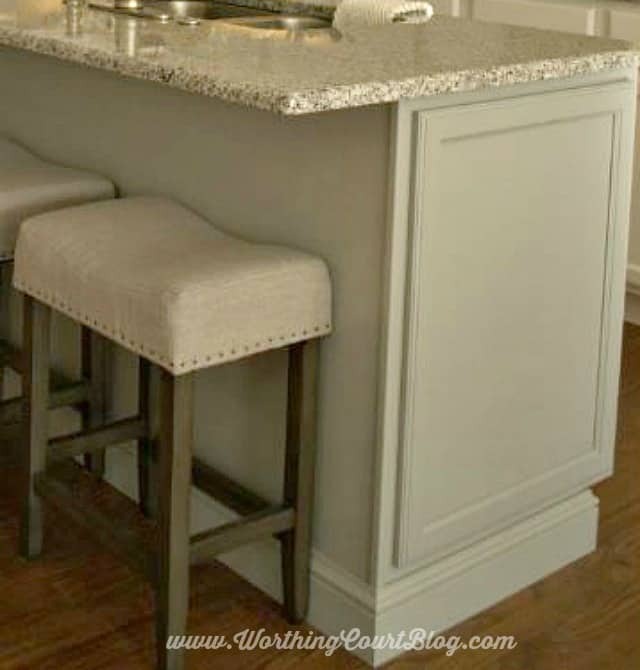 Those stools are perfect in your kitchen as well and I can’t wait to see your final choices! Hi Jane. How cool that your sil is building right beside you! I think that I’m backing away from beadboard for exactly the reason that you said. I’m so glad that you like everything so far! What a beautiful white kitchen you’ve created. My two cents worth : depending on the final color for the walls I would use a color rather than any kind of white. Even a very soft color like the gray you mentioned would give a slight break to a solid mass of white. A small band of accent trim if you use tile would be nice. The whole look could stay soft and clean looking but have just enough of a difference to actually accent the white. You are now making the fun choices. Enjoy the kitchen! That’s a great suggestion, Iris. I’ll have to grab some samples of gray and see if I can find one that works well. Suzy, Your kitchen is gorgeous! 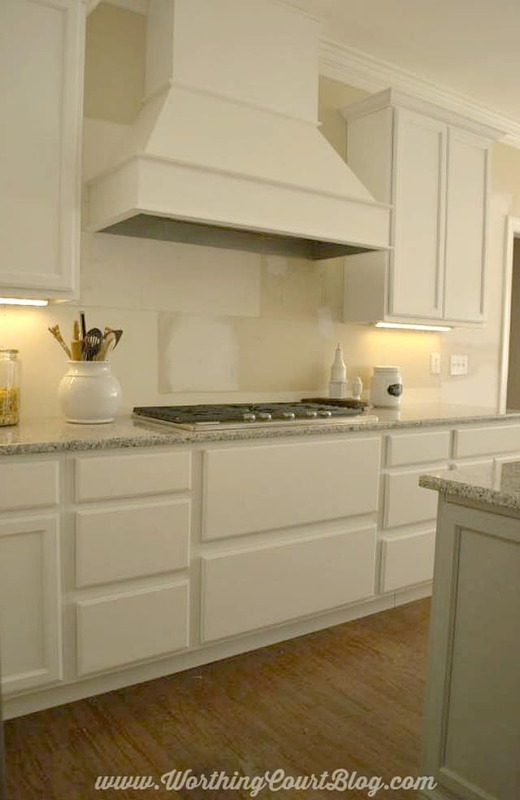 I would go with the light gray or white subway tile instead of bead board because of the maintenance. Thank you, Sherry! As much as I love the look of beadboard, I’m starting to shy away from it. Several have people have mentioned the maintenance factor, which has me rethinking the whole thing. Hi Suzy. Love your new kitchen. Just recently came to reading your blog and truly inspirational and great tips. Couple of things that came up in my head when you were talking about your backsplash. One is I love love love subway tile what about in a herringbone pattern or maybe a nice glass subway tile. Another thing that came to mind was penny. Tile they have great colors you can choose from. Well good luck, I’m sure whatever you choose will look great. Can’t wait to see what you have for us in 2015. Hi Artemis. One of my problems is that there are so many things to choose from! I love the idea of using a herringbone pattern and I adore penny tile! Happy New Year! 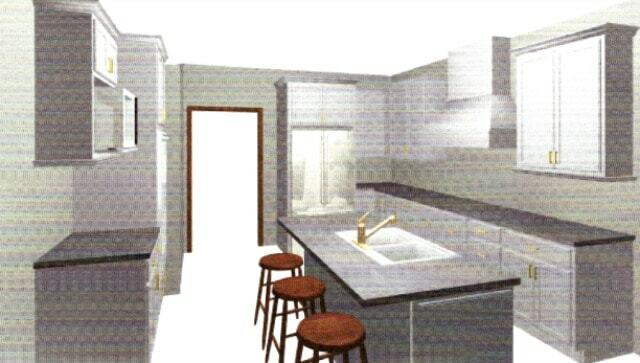 Stunning kitchen…even with it not being totally complete. You’re too sweet, my friend. Thank you! It’s absolutely stunning! 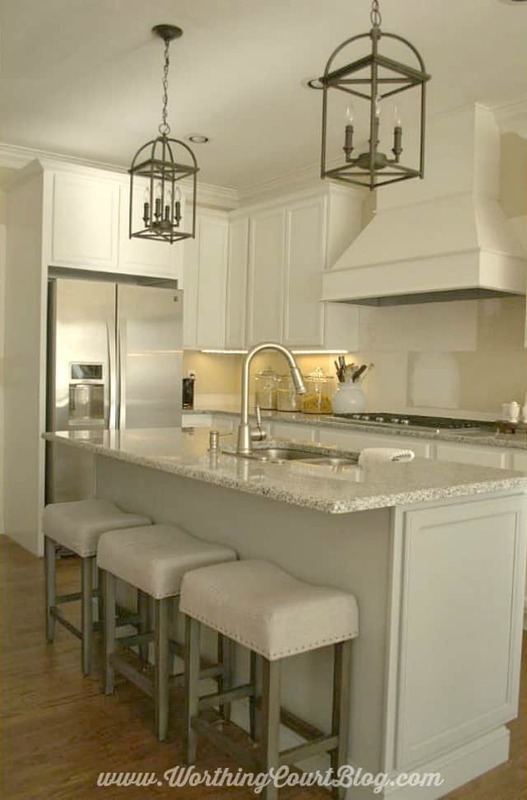 I am planning a white kitchen too and I love all your choices down to the lanterns and the barstools! Great job! I’m so glad that you like everything, Shelley. Thank you! What a beautiful kitchen! Can’t wait to see the final product! Quick question – Did you use a different soap dispenser than the one that came with the Delta faucet? We just bought a Delta kitchen faucet as well and will be installing it soon, but I’m not crazy about the style of the soap dispenser. If you used a different one, would you mind telling me where you found it? Thanks! Hi Meredith. I’m glad that you like my kitchen! Yes, I used the soap dispenser that come with my faucet. Have a great day! Suzy, how very exciting to see your vision finally come to life! I love all your choices and the layout. The color on the island is so pretty. So happy for you, and you have me daydreaming about our future kitchen remodel. I am glad to wait on it if it comes out anything like this! You’re so sweet, Lisa. Thank you! Suzy, it looks GORGEOUS! We are still in the middle of our kitchen remodel, so I completely empathize, it seems to be taking us FOREVER, lol. I love yours! The island with the sink is fab. Thank you so much! I hope your remodel is going well.